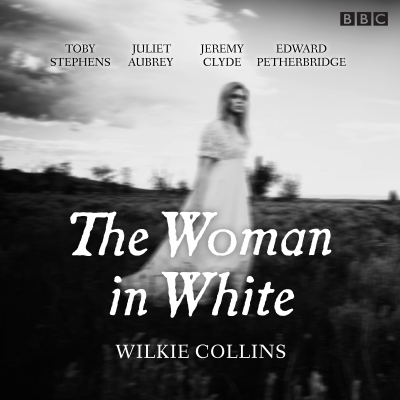 Toby Stephens and Juliet Aubrey star in a BBC Radio 4 full-cast dramatisation of Wilkie Collins chilling Gothic drama. A lonely stretch of road on Hampstead Heath is the venue for Walter Hartright's midnight first encounter with a mysteriously distressed figure in white. As he helps the woman to escape from unnamed pursuers, he has little understanding of the way she will affect his future. At Limmeridge House, in Cumberland, Walter meets and falls in love with Laura, who strangely resembles the woman in white. She, however, is soon to marry the financially embarrassed Sir Percival Glyde. Events at Limmeridge take a surprising turn when Anne Catherick arrives, and Walter recognizes her as the mystery figure. It appears that Anne's recent incarceration in a mental asylum was at the behest of Sir Percival, who is all too aware of the secret she holds. More than one life will be lost before Walter's mystery of the woman in white can be fully explained. A strong cast brings Wilkie Collins tale to life in this BBC Radio 4 production, recorded on location at Beacon Hill, London in 2001. Wilkie Collins was educated at private schools in London.In 1846 he was called to the bar, but his real interest lay in writing. He is the author of the novels Antonia: or, The Fall of Rome, Rambles Beyond Railways, and, with Charles Dickens, Household Words and All the Year Round The Lighthouse, and The Frozen Deep. Collins own work consisted mainly of short stories and novels; these included Hide and Seek, The Dead Secret, Armadale, and The Moonstone."